I guess I should actually post updates too, since I am technically the thread maker. First things first, lets talk about that expansion party. Normally I set my unit up such that the jaguars are off to the side and behind the arrow catchers. However, this time I put them directly behind because of the particular type of unit I'm facing. There are no archers in this province, but I still have my jaguars behind the slingers. The primary reason is because of the unit I'm fighting. There are a handful of these lizard riding amazons in this province. They themselves are not very dangerous units (there are some unmounted amazons here that I am not concerned about at all), but their weapons on a mount can make them quite dangerous. As I've said before, jaguars are not very resilient units. They are quite strong offensively, but rely primarily on their shape change to survive, it means they can almost always get out of the first round of combat alive. However, these amazons have two attack, their light lance, which gets a somewhat large damage bonus, and the lizard bite which is quite good. This means thats its entirely possible for them to kill a decent number of my jaguars on initial contact with my jaguars. Therefore, what I did was set my slingers up so they'll take the first charge from the amazons. 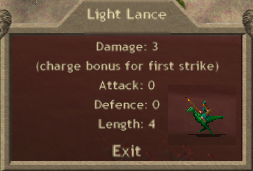 This means that the light lance bonus attack is wasted on my chaff and I don't have to worry about my jaguars dying in drove on the first set of attacks. Essentially I am just trying to eek as much long term efficiency out of my squad as possible, I am sacrificing a few of my arrow catchers to try and keep the jaguars alive for a few more provinces. 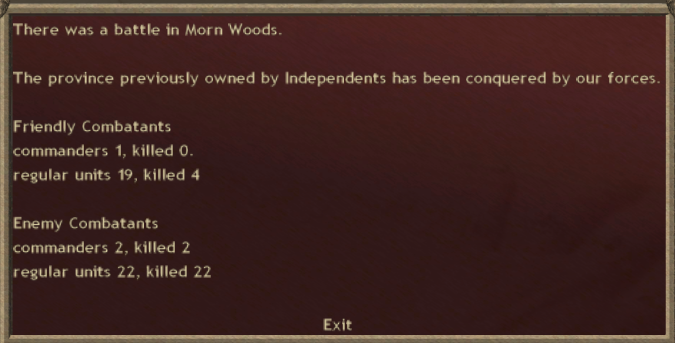 I end up taking the province without too many casualties, I think I lost a jaguar or two just to the melee, but nothing too terrible. It's possible I could have gotten out without losing too many jags if I set them in front, but I'd rather jut avoid the risk in general. I set up to continue expansion in direction of the weakest group, it has heavy cavalry, which pose a similar problem/thread as the amazons, but I still have enough slingers alive to catch their lances safely. I make a quick bid for a group of mercenaries. I personally like the heavy infantry mercenaries. They can generally safely take two or three of the weaker independent provinces alone, which is good enough for me. I also spot some dominion to my south, I notice its sloth, growth, and luck. Having talked to some people on IRC, I am fairly sure that both Sauromatia and Hinnom have strong scales so they wouldn't have sloth. I know Pan is likely to have luck since they're likely to have neutral order, but I also know that Dexanth loves luck, so my current assumption is that it's Irony or Death (Pan) or Dexanth (Arco). 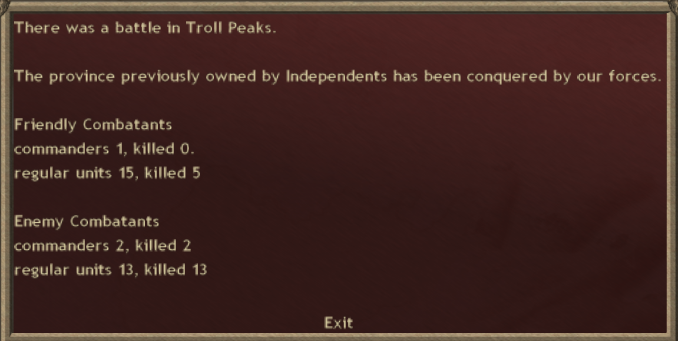 I repeat the same process against the heavy cavalry province, with about roughly the same results. Two of my priest mages entered the hall of fame, so they got heroic abilities. The heroic reinvigoration could be good for a mage, but truthfully I am unlikely to use it, due to the paths the mage has. So unfortunately these are mostly useless. Unfortunately my bid failed to get the mercenaries, and the gold is refunded to me. I set up to repeat the lance catcher magic against a third province with my first expansion party (probably tempting fate here, since there are so few units left), and I set up to go attack the dark vine province. Dark vine provinces are almost always the same. 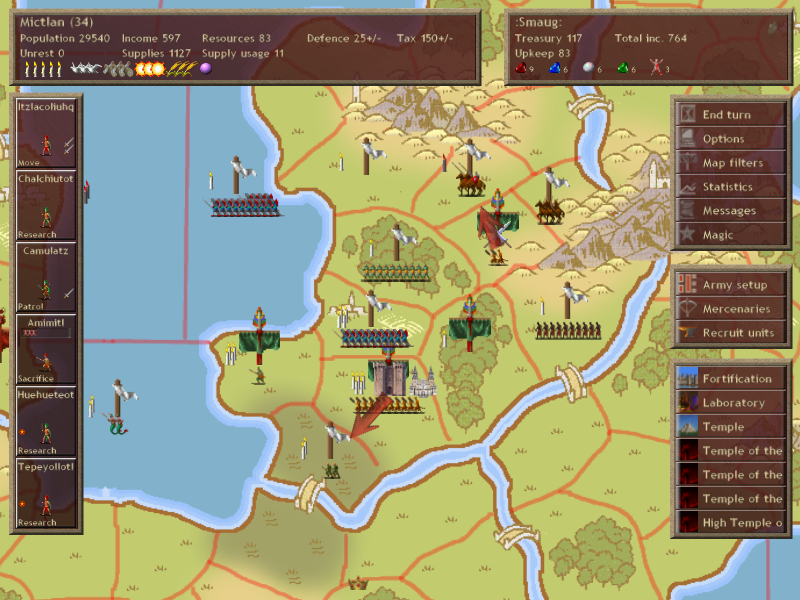 You can expect certain things to always happen with them, so I am going to set up my troops in such a way to hopefully counter most of the problems that are present in the province. Lets go to the army setup screen. 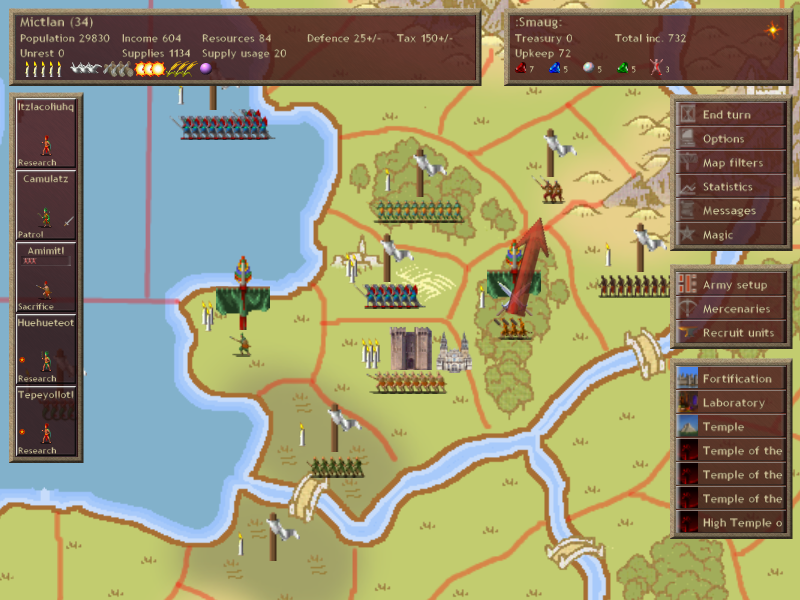 Here you can position your troops for upcoming battles and script commanders and squads of troops to follow specific orders. As you can see, my priest is just set to cast divine blessing and then follow through with whatever spells he wants. Nothing special there, but scripting will eventually become important. The important part is really in the troop placement. 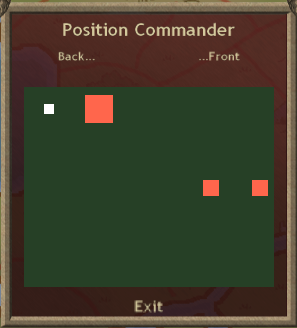 The white box is the group you currently have selected, the orange ones are other units on the field, blue would be commanders, but the only commander in the battle I have selected right now. In the other screen shot above you can see multiple little position boxes for each group. Anyways, there are three threats I feel like I need to deal with in this province. The first is the blood druid will be spamming low level blood spells. I expect them to use bleed, a spell that causes a poison-like effect, and I believe they also like to cast agony, a spell that causes a morale reducing effect in an aoe. I separated two groups of slingers to absorb the brunt of the spells, since they're up front. The druids will pass out before too long, due to the extremely high fatigue cost of blood spells. 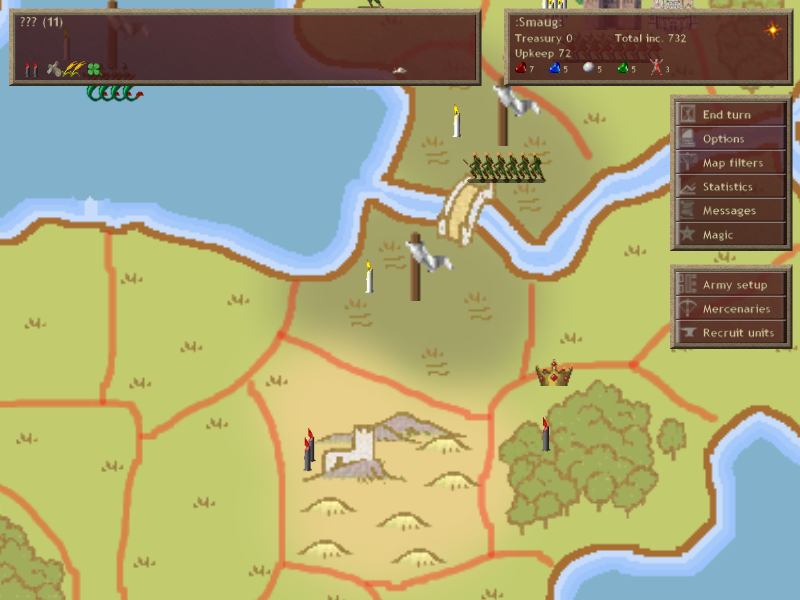 The second threat are the ranged units that tend to accompany these provinces. Sometimes its just short bows, but other times there are blowpipes, which paralyze units. 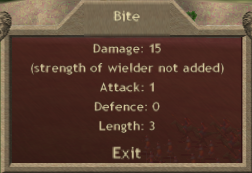 Something that can be quite frustrating against melee oriented units, so I've set up the shields in front to take the poison in place of the jaguars. The final problem to address is the dark vines themselves. They're essentially brute type units, high strength, high HP, strong attacks. However they have a weakness to fire, and they'll likely die against concentrated jaguar attacks. Additionally the jaguars two lives will work nicely against the dark vines as they don't have many attacks to spread around, and my jaguars are likely to survive the melee with very few casualties.